A regional publisher has celebrated an inaugural day honouring one of the counties it serves. The first ever Norfolk Day was held on Friday after a campaign backed by Archant dailies the Eastern Daily Press and Norwich Evening News. The initiative, also backed by BBC Radio Norfolk, prompted people across the county to hold more than 300 events marking its heritage. Following the day’s success, a 2019 event will now be held on the same 27 July date. David Powles, editor-in-chief of the EDP and Evening News, said: “Wow is all I can say after such a vibrant and exciting Norfolk Day. “Hundreds of people got behind the day which proved to be a hit across a variety of communities and businesses. Norfolk Day’s biggest success was bringing people together and celebrating the best of county life. Speaking to HTFP, David added: “We launched Norfolk Day in February this year alongside BBC Radio Norfolk. 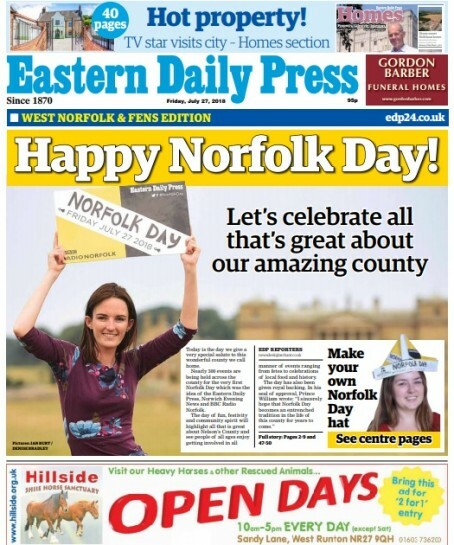 The response has been staggering with over 400 events held last Friday, along with social media support from Stephen Fry, a Jake Humphrey reading of our love letter to Norfolk, the backing of Prince William, #NorfolkDay trending nationally for much of Friday and so many more great stories. “The Norfolk people have really got behind it and it has filled the whole team here with an immense source of pride that an idea we ran with captured the imagination in such a way.